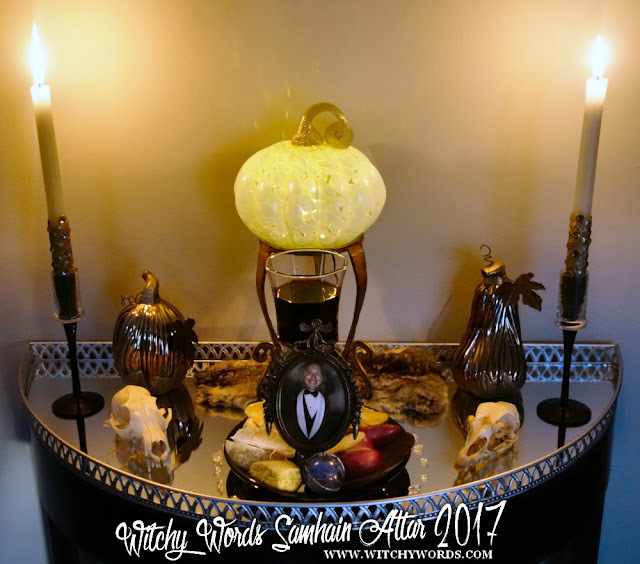 To see 2014's Samhain altar, click here! Samhain: The Night of the Thinnest Veil. Witches celebrate this holiday as both the new year and as a day of remembrance for those lost. Traditionally celebrated on October 31st but variably celebrated when looking at the scientific date, Samhain is a night of great joy and sorrow. It is the final harvest, an ending of the season of abundance as the first frost is right around the corner. This first frost is the definitive mark for me. The mass exodus of plant and bug life quakes the veil between the worlds of the living and the dead. As life passes through to death, so does death pass through to visit the world of the living. And so we see our loved ones, bid them hello and farewell, and connect with the Other across this void. While most celebrate it on the traditional day, I prefer the scientific date which fell on November 6th this year. I feel the veil is clearly thinner post traditional Samhain than beforehand. In fact, our first frost of the season was November 2nd, which seemed appropriate to unlock the veil. This year, my little family has been fortunate as to not have lost anyone terribly close to us. We had some close calls but it seems the veil stood strong for those near me. Instead, I chose to honor a close friend from the past. 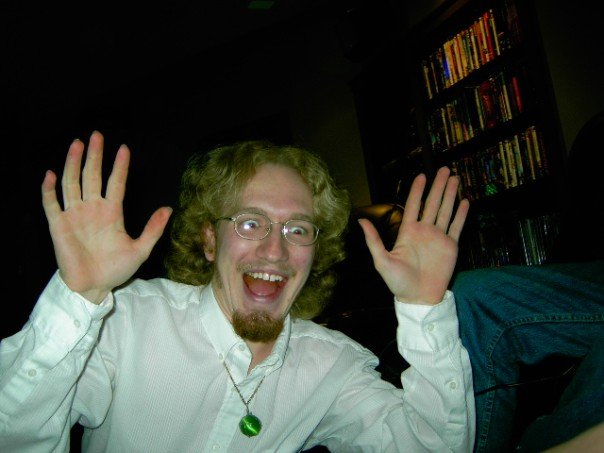 Nate passed away October 2nd, 2006 at just 20 years old. I can still remember quite clearly the moment where my then-boyfriend, now-husband, called to tell me. He'd just found out himself and we were trying to get everyone together to mourn. I just remember my back slamming against the hallway wall, falling to a squat position and sobbing. My parents had no idea what had happened and I tried to tell them while choking back tears. Nowadays, I handle death in a much different fashion. Nate certainly wasn't my first close brush with death but he was my first close brush with suicide. 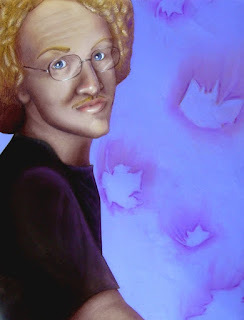 After his death, I drew a large portrait which I later gifted to his parents as a way of working through my grief. While drawing, I was visited my Nate who turned on a light overhead and kissed me on the cheek as if to say "All is well." 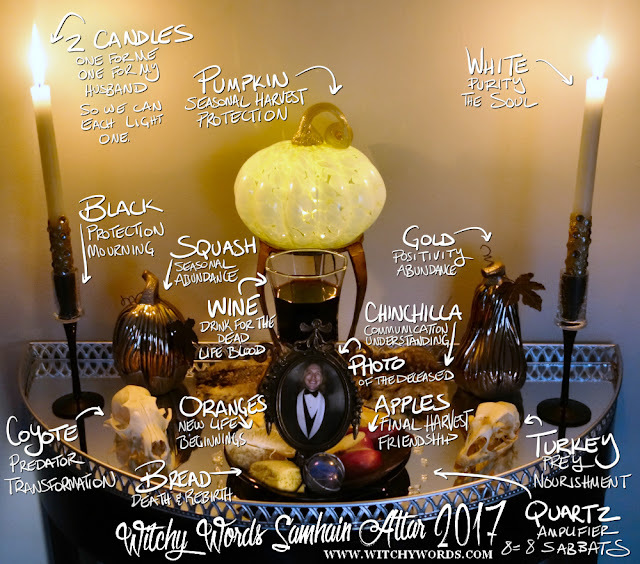 When I was deciding on what soul I was honoring this Samhain, the mention of Nate made one of our lights suddenly turn on in the front room. On my altar, I've placed a photo I took of him from my husband's senior prom along with a wire-wrapped necklace he gave me. Each of his closest friends received one. Mine has a pentacle on it because Nate was more than aware of my beliefs. Yet another reason I felt comfortable honoring him this year. It is customary to leave food and drink out for the deceased. When they cross the veil, it beckons them to visit and share a meal with you. It also gives their soul nourishment on their journey. On the plate, I included various breads representing death and rebirth through the cutting of the grain and transformation into dough. I've also offered apples honoring our friendship and oranges for new beginnings in hopes that Nate is happy in a fresh start wherever he may be. I also poured a glass of wine for him. I'm not sure if Nate liked wine; I'm not sure he ever got the chance. But it seemed appropriate and I think he'd drink a glass with me if I asked. Around the plate are pieces of quartz - eight on each side representing the eight sabbats in both their most positive and darkest lights. These pieces of quartz amplify the energy of the food, making the call to Nate louder. Behind the plate sits a lit glass pumpkin. Pumpkins are often among the last seasonal harvest. We carve pumpkins into lanterns to scare off bad spirits and light the way for our beloved dead. Thus this lantern serves as both protection and guidance for Nate. Plus I love the pattern it creates on the wall! On one side of the plate, I've placed a coyote skull. These predators represent transformation, which to me connects to the transformation we undergo in death. On the other side, I've placed a turkey skull. Turkeys are common prey to coyotes, so this skull in addition to the prior creates the circuit for the cycle of life. Turkeys are also in season and represent nourishment. Nourishment is appropriate given that we feed our beloved dead on this holiday. You'll notice that I've dressed the altar in whites, blacks and golds. White represents the purity of the soul while black represents protection during mourning. The gold is a flicker of positivity, a ray of light in the dark. When we're mourning, those around us nourish us, be it through food, emotional support or crisis relief. The gold on this altar represents the abundance of support during times of emotional toil. Behind the plate and under the pumpkin lantern, I've placed a chinchilla pelt. Chinchillas are social and perceptive creatures, whose strength in understanding and communication are essential during this time of the thinning of the veil. If we want to get into contact with our dead and understand what they're trying to tell us, projecting the chinchilla would certainly help. On either side of the altar are two candles - one for me to light for Nate, and one for my husband to light. Nate was originally my husband's friend and, by proxy of being the girlfriend, became my friend too. It's only fair that I offer him the opportunity to light a candle for Nate. Also, above the altar, in keeping with the theme of the previous harvest altars, I've placed a wreath. Its bare nature speaks to the final harvest, the coming frost and the now-bare limbs of the trees outside. 2017 has been a very long year. Samhain represents the end of this difficult year and I can now go into "hibernation mode." My job is slow, the world is barren and cold, and I'm tired. I think I'll rest. Honor be to your ancestors, both blood and non-blood.